DESCRIPTION Stunning lakefront bungalow with fully finished walkout, oversized 3 car garage, and absolutely gorgeous landscaping! 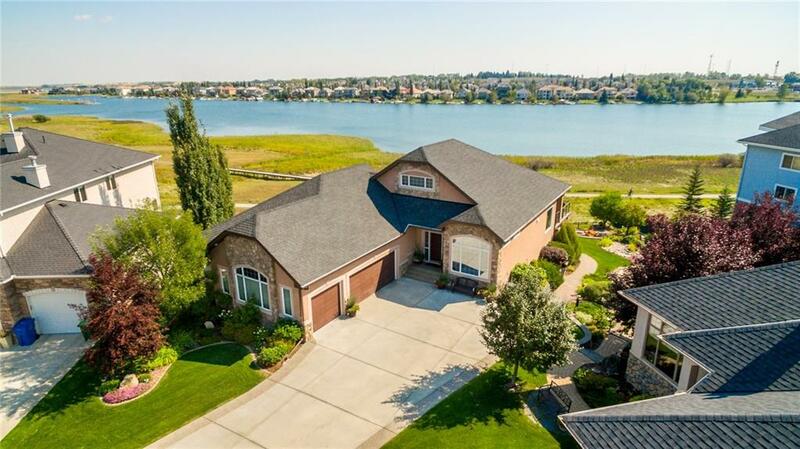 This executive bungalow offers an open concept with extra height ceilings and windows to take full advantage of the lake location. Whether you are in the living room, eating nook, or in the upgraded kitchen....the views are amazing. Granite counters, large island, upgraded cabinets, and tile flooring make the kitchen area a great place for entertaining and day to day living. The master suite also provides views of the lake and the upgraded ensuite with a skylight, double sinks, granite, soaker tub and separate shower is yours to enjoy. The walk out level is fully finished with a large family room featuring a 2nd gas fireplace, wet bar, full bathroom, and 2 bedrooms. If you are looking for an executive bungalow with a walk out basement, oversized 3 car garage, and extensive custom landscaping....this is the opportunity you have been waiting for!